A New York police officer was killed Wednesday night in a two-vehicle crash, state police said. Officer Kevin Crossley was in his Whitesboro, NY, Police patrol car when his vehicle was struck by a Chevrolet Avalanche at the intersection of Oriskany Boulevard and Westmoreland Street in Whitesboro just before 8 p.m., reports WKTV. He succumbed to his injuries at the hospital. “Last night we lost one of our fellow part time Police Officers. 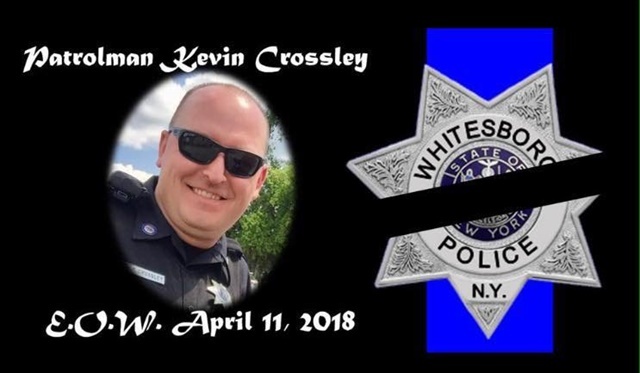 Officer Kevin Crossley who was working in the Village of Whitesboro was killed in a 2 car motor vehicle accident on Oriskany Blvd,” Whitestown police posted on their Facebook page Thursday morning.